You Save: $14.06 (41%) Ships in 1 day. Hard Cover, 173 pages, 10.25 x 10.25. Over 60 recipes, many from New Orleans most celebrated chefs and restaurants, including Emeril Lagasse, Susan Spicer, Paul Prudhomme, Commander's Palace, Galatoire's and many more! 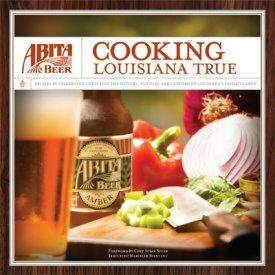 From appetizers and side dishes to main courses and even desserts, every recipe contains Abita Beer as an ingredient. More than a cookbook it is also a history book and tasting guide with chapters about the history of beer in New Orleans, the beer making process and valuable tips on pairing beer with food, selecting proper beer glassware and educating your beer palate. The 184 page hardcover book includes over 80 photographs. Every recipe was tasted and tested by Marcelle Bienvenu, noted cookbook author and food columnist. Anyone who enjoys fine craft brewed beer and classic Louisiana cooking will find many delicious reasons to give or get this handsome book. The Abita Brewing Company was founded in Abita Springs, Louisiana in 1986 and is the first and largest craft brewer in the southeastern United States. Abita creates full flavored specialty ales, lagers and an all-natural root beer.